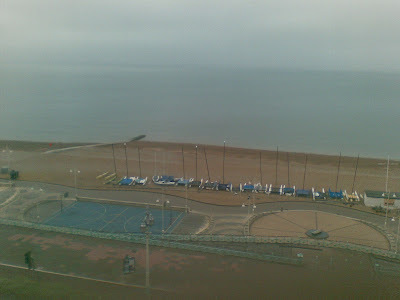 When i was at the BI Forum in Brighton, one of forum participants had a question on using Web Services in BI EE. BI EE currently does not support direct WSDL response consumption by passing a request. So, in order to achieve this one way is to write a pl/sql wrapper which would basically call the web service and then use EVALUATE within BI EE to display them. There are other approaches as well like writing a pipelined table function etc. We shall see the other approaches in a later blog entry. 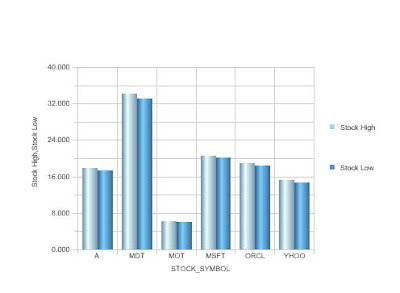 Assume that we have a table as shown below containing the companies and their corresponding Stock Symbols. 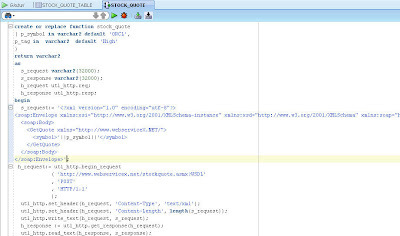 The requirement is to display the live stock feeds(Day High as well as Day Low) from a live Web Service feed at http://www.webservicex.net/stockquote.asmx?WSDL within BI EE. One good thing about this service is that they offer a variety of web service feeds along with their statuses. In order to consume the stock feed, lets first create a pl/sql function which is nothing but a wrapper, that sends a request to the WSDL above and gets the response back. The request sent would pass the Stock Symbol as a parameter. The Pl/Sql function would basically extract the Day High and Day close (or any other parameter) values directly from the stock feed. As you see the above function basically does a string manipulation to extract the parameter values. Typically this is not a recommended approach. The recommended approach is to use an XMLType function or a Regex function to extract the parameter values. But in our case, the string is sufficient. If you are behind a proxy, ensure that you set the UTL_HTTP.set_proxy before the begin request function. To test this out, lets fire the function from command line. 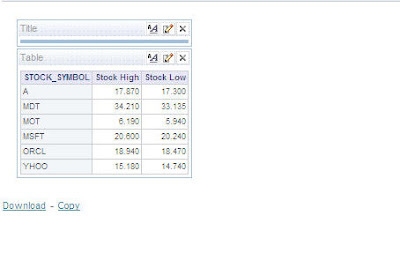 As you see we get the Oracle stock quote high and low for the day directly from this function. Now, lets go to BI EE and call this function through EVALUATE. 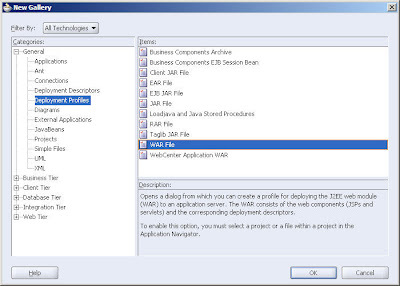 As you see we have now displayed the response of a WSDL directly from BI EE. We shall look at other approaches in future. 1. Time Based Last – In some cases, when we are at a year level, we would like to see the amount sold for the last month(December) alone instead of a summation of all the months. But the aggregation for all the other dimensions (and their levels) would be SUM. 2. Time Based First – In some cases, when we are at a year or a quarter level, we would like to see the amount sold for the first month of that quarter or year instead of a summation of the all the child months for that quarter/year. But the aggregation for all the other dimensions would be SUM. 3. Time Based Average – In some cases, when we are at a year or a quarter level in the Time dimension, we would like to see the amount sold as an average of all the corresponding child months for that quarter/year. But the aggregation for all the other dimensions would be SUM. 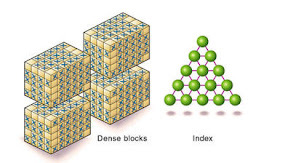 As you see, we basically have 2 dimensions. One is Product and the other is Year. In the report containing Top Level of Product and Year Level of Time, the report has produced a number which is nothing but sum of amount sold for all the products in the last month of that Year (December). So, basically there are 2 kinds of aggregation for the same measure. The method for achieving this though is pretty simple, i wanted to introduce this here so that this can act as a pre-cursor to even more complex dimension based aggregations which i would show in the coming blog entries. To achieve this, open up the repository and go to the aggregation tab of the measure that you are reporting against. 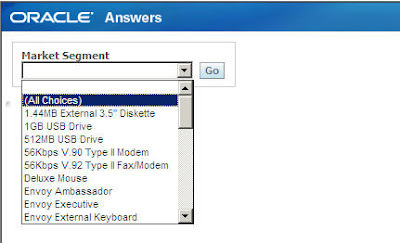 Now choose the based on dimensions option. 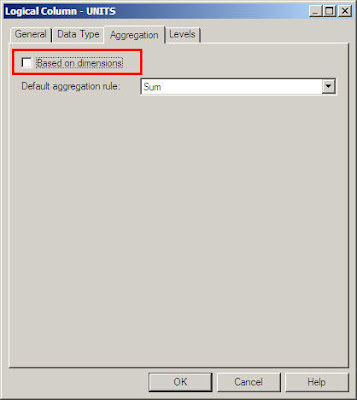 In the aggregation list first choose Other Dimensions and enter the aggregation as SUM. After that choose the Time dimension and enter the aggregation as LAST. 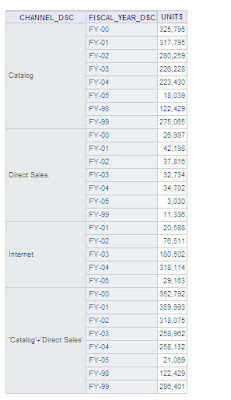 Ensure that the order of the dimensions listed above are the same. So basically what this does is, it sets the aggregation of the measure for all the dimensions apart from Time as SUM. For Time alone it would do a LAST aggregation. The order of the dimensions ensure that the LAST operation is carried out after the SUM. Now create a report on Time and Product. You would notice that whenever upper levels of Time dimension is queried upon, it would result in LAST aggregation. 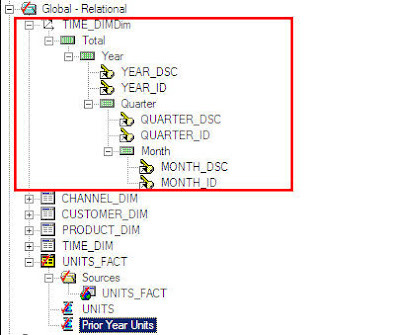 If you look at the actual query fired, you would notice that TIME based LAST aggregation would be performed on a Summed up product dimension. There are 2 ways of producing this summation. One is by making the BI Server to fire a query back to the database (which would generate the sum) and the other is by letting the BI Server itself to produce the sum. 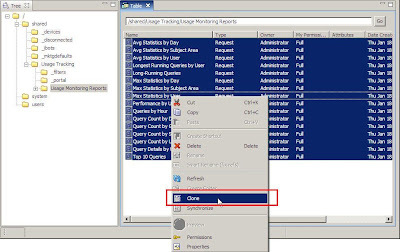 Lets first choose the first option by disabling the report based totals(making BI EE to generate the sub-total query as well). 1. 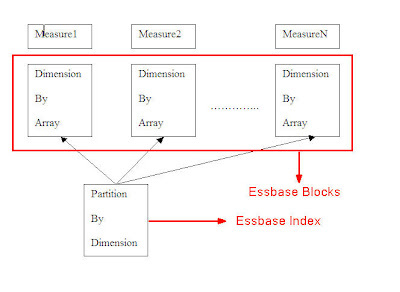 Sparse Dimensions that are stored as an index – So, these dimensions are typically stored in a normal relational row-wise format in Essbase. If you understand this analogy, it would be easier to understand the analogy between Essbase member formulas/calculation scripts to the MODEL RULES clause. I would go into detail of how these 2 are related in a future blog entry. 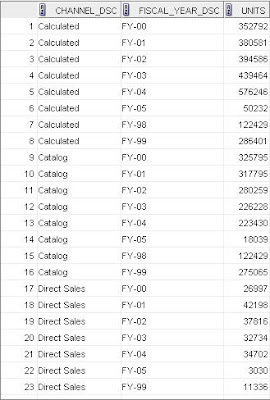 For now, lets take another pivot table example as shown below. In order to do that, we would have to generate a rule that would produce a new set of rows in addition to the existing rowset. As you see, MODEL clause has quite a few advantages whenever we have data manipulations on a summarized result. We shall see more complex examples in a future blog entry. 1. Get the flow correct – I missed that completely yesterday. For the 1st 15 mins, i did not get any single question which meant that i was not coherent enough to make the audience understand. 3. Rehearse atleast once before you present – Well, i thought this was not needed at all. To my utter dismay, i was found lacking in this aspect as i could not get the audience glued to the presentation. Christian was kind enough to fill in and after that the Q&A session went very well. Unfortunately, i could not get any photos to post here. Let me get try to take them today. All in all the conference was good so far. There were key presentations from Craig Stewart who presented the Roadmap on ODI. Today we have a session from Mike which i believe should be interesting as he would be presenting the Roadmap on 11g. All in all the conference has been excellent so far and i should thank Mark & Jon and their team of Borkur, Peter, Ragnar made us feel at home. It should be another interesting day of presentations today. I was recently involved in a migration project wherein the customer was migrating from a custom OLAP solution to Oracle OLAP. The customer had around 1200 reports reporting out of a single BI EE repository. 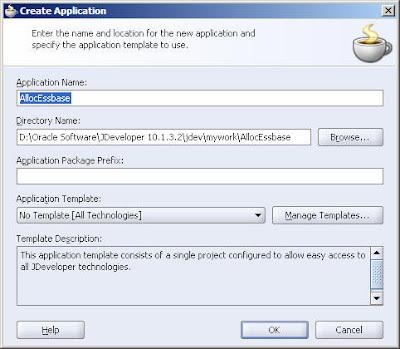 I was brought in to build a repository on Oracle OLAP 10g. Since it was a migration project and since only the backend was changing, the customer expected all the reports to work out of the box on Oracle OLAP. 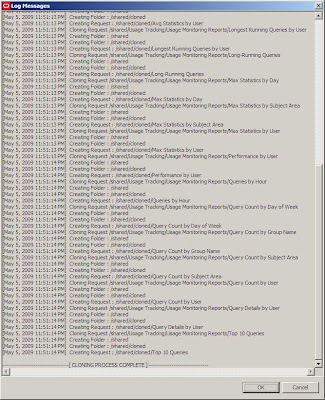 So, my job was to build a repository from scratch using SQL Views on OLAP 10g, and at the same time ensure that none of the reports actually break due to this new repository. It was a very interesting exercise since one would have to use the concept of dimension binning on all the dimensions. Though dimension binning itself is a straightforward concept, the implementation itself was pretty tricky due to multiple hierarchies in each dimension and i had to dedicate around 8 hours to build the repository and at the same time get it right in all aspects. There are certain concepts that one would have to be aware of while building a BI EE rpd on Oracle OLAP 10g. 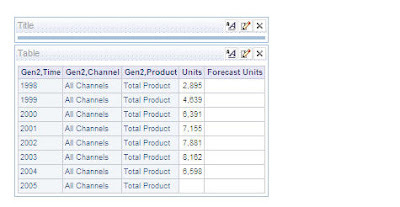 On OLAP 11g(which the customer was not willing to migrate to) though, this would be a straightforward exercise as 11g offers out of the box MVs for facts and dimensions. So, in effect, 11g OLAP cube would be treated as a simple star schema. I would cover those concepts like using EVALUATE_PREDICATE, Dimension Binning, Multi Hierarchy fragmentation etc in a future blog entry. While working on this repository, i noticed that there were certain prompt requirements wherein i had to hardcode the logical sql since a direct select on the column would produce a drastically costly query on the OLAP SQL Views. This led me to write today’s blog entry which is about logical SQL. 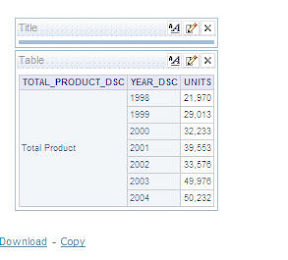 As you would probably know, Oracle BI Server generates 2 types of queries. Logical and Physical. 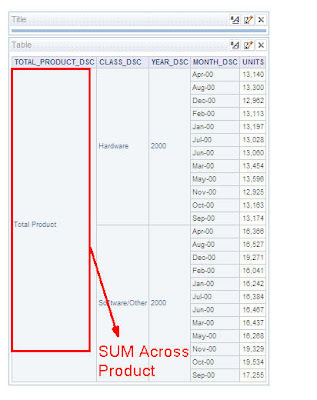 When columns are chosen in a report, a custom logical sql is generated and BI Server converts this logical sql to the actual physical queries. Now, how different is a Logical SQL from a Physical SQL, in terms of structure as well as in terms of functionality. This blog series would cover this. 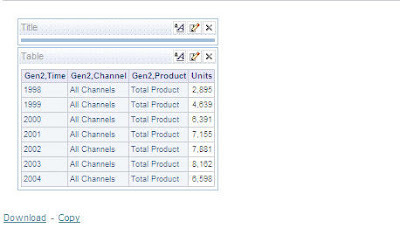 FROM "Global - Prod & Dev"
If you look at the actual query generated, you would notice 2 queries being fired parallely. 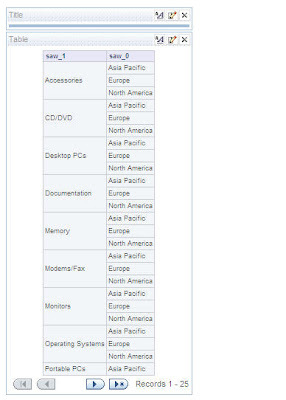 "Global - Prod & Dev"
In effect, the dashboard prompt would ignore the 2nd column and hence you should see all the products for which there is a transaction in the fact table. The other approach is to create a logical SQL that will use the above query as a subquery. Once we understand how the logical SQL works, it would become even more clearer on how BI Server generates the physical queries. Today we just saw some basic logical SQL queries. There are more complex queries possible to cater to different kinds of reporting requirements. 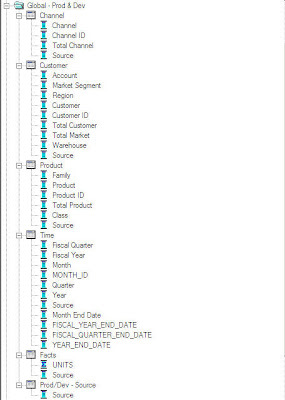 The only drawback in using the custom SQL is that, end users lose the capability of doing the native hierarchy drills. But sometimes logical SQL becomes an indispensable tool to have. We shall see more later. I have been on a couple of customer calls this month wherein the customer wanted to know a seamless means of migrating their web catalog from one environment to another. The first thing that came to my mind was the CAF (Content Accelerator Framework) that came out a couple of weeks back. Though i had recommended this to the customers, i also informed them of the fact that this was in its first release and hence there are bound to be one or 2 resolvable hurdles. Now that i am involved in creating a couple of custom utilities myself, i thought it was time to check out the capabilities of the utility. This blog entry is a result of that. I must thank Phillipe(CAF PM) and his dev team for working with me on this. There are certain pre-requisites for the CAF to work. 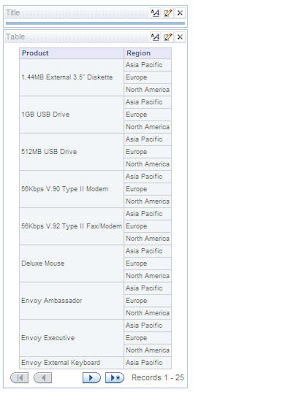 Work is under way to update the documentation as well. Following are my findings. 1. CAF is certified to work on 10.1.3.4 and above. 2. CAF requires JDK 1.6 as the active JDK. 3. CAF mandates the use of a Repository with relational objects. If you have Essbase as a data source, it might not work. Though i am not sure about this one as this was the only reason i could attribute to some of my repositories not working with this utility. If you find it otherwise, just leave them in the comments section. 4. I believe CAF does not mandate BI EE itself to be installed using JDK 1.6. 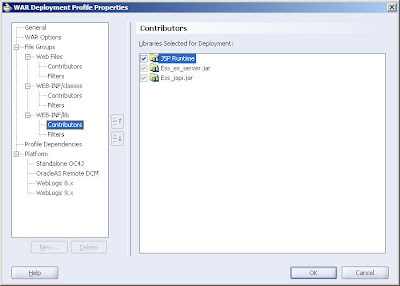 JDK 1.6 is required only for the client catalog manager. 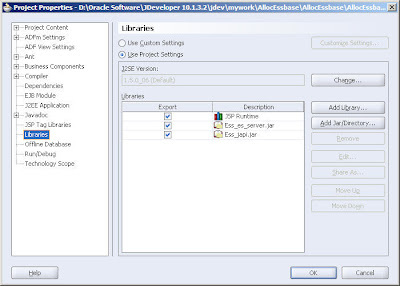 Ensure that the path variable (on the client catalog manager machine) points to JDK 1.6. Now lets get into an actual use case scenario. Consider that we have 2 repositories and 2 web catalogs. One is the default samplesales repository and the other is the usagetracking repository provided with the default BI EE install. Now, BI EE provides out of the box web catalog containing reports and dashboards going against each of the repositories. Now our aim is to merge both of them together into a single repository and web catalog. 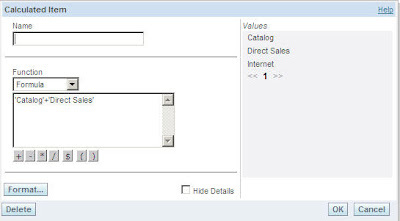 To do that, lets first start with merging the samplesales and the usagetracking repository. This is done using the 3 way merge that i have discussed here before. 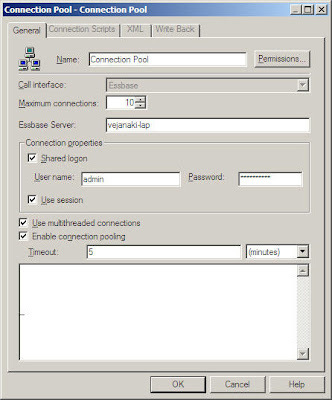 As a first step, create a copy of the usagetracking.rpd. Once this is done, open the samplesales.rpd as the current repository. 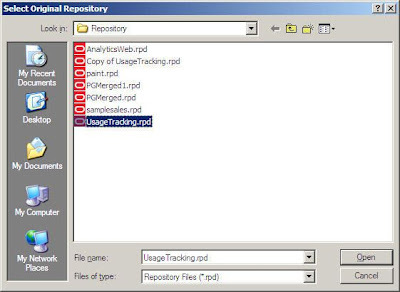 Choose the usagetracking.rpd as the original repository. Now choose the Usagetracking.rpd copy as the modified repository. And also make the necessary mappings to ensure that the merge happens correctly. Now you should have a merged version of both the repositories. 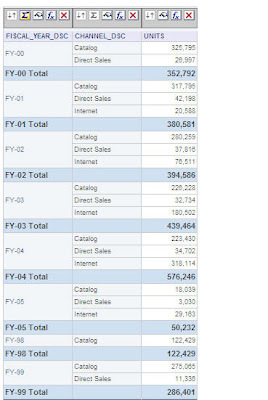 As a next step, we need to bring in the usage tracking reports into the web catalog of sample sales. 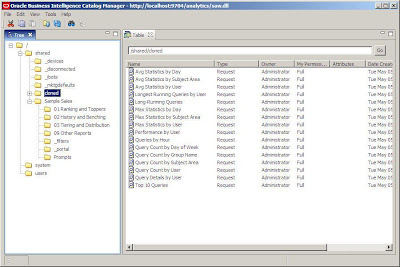 So, log into the catalog manager and navigate to the usage tracking web catalog. And choose all the reports that we want to migrate. This would pop up another screen wherein we would have to choose the source rpd, target rpd (which would be the merged repository in our case). Also an online web catalog would have to be chosen as a target. 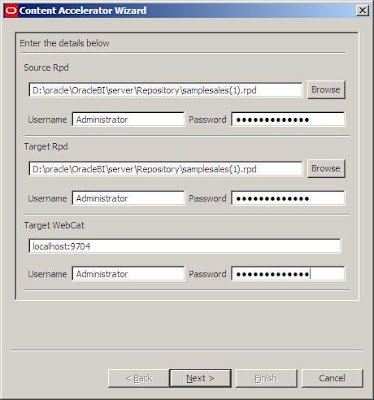 The major advantage with this migration is that all we need is an access to the target webcatalog (which would be accessed through the same http server port). Also, CAF utilizes another utility called nqXUDMLGen.exe and nqXUDMLExec.exe which are basically similar to the older nqudmlgen.exe and nqudmlexec.exe. 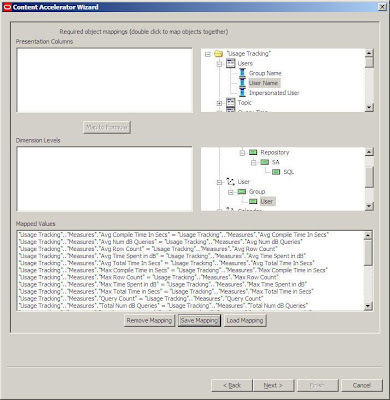 The major difference lies in the fact that now the entire repository is visualized as an xsd schema containing references to the actual objects. The xsd schema is given below. And the output of the nqXUDMLGen.exe would not be a UDML text file anymore. 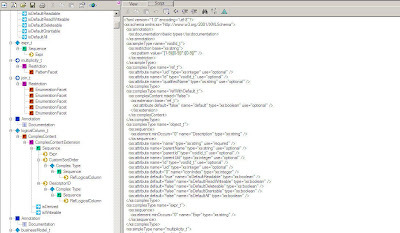 Rather it would be an XML file which would be in accordance with the xsd. Click on next. 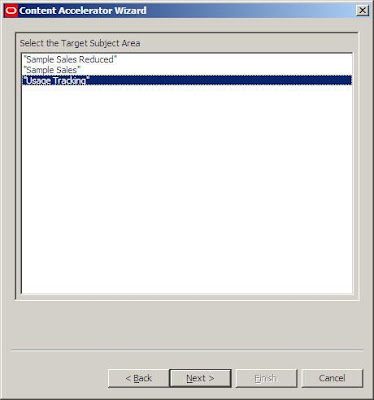 And select the subject area to which the reports metadata would be mapped to. So, in effect you would have to choose the reports that have their columns within a single subject area in the previous screen. In our case, it would be usagetracking. 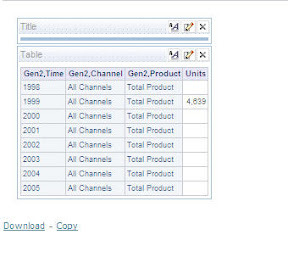 In the next screen you would find a mapping between the source report columns and the target metadata. 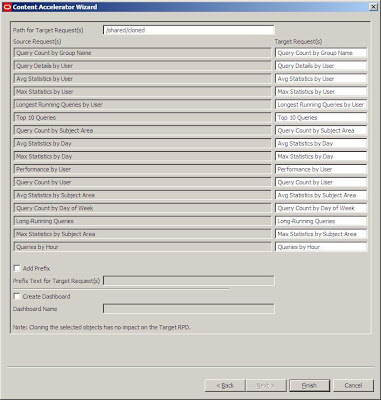 What i would have liked is an automapper if the source and target rpd columns match. Unfortunately, we would have to map this one by one. But to circumvent this, the mapping structure can be saved so that it can reused in future migrations as well. In the next step, enter the path in the target catalog. This is the path the reports would be migrated to in the target web catalog. 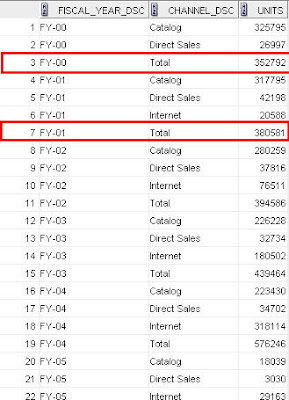 Now, if you open up the target web catalog you would notice that the reports have been migrated successfully. Though the extent of usage of this utility(customer adoption) is pretty small, the concept this introduces is very robust and can be reused across multiple implementations. This also introduces the XUDML which should give you a sneek peak into the world of 11g. Apart from the installation hassles, this utility does what it promises to do and does it very well. The only hiccup that i see is the Essbase related XUDML issue. But i believe this is something that can be sorted out pretty soon. Hopefully we should see more of similar tools. 1. 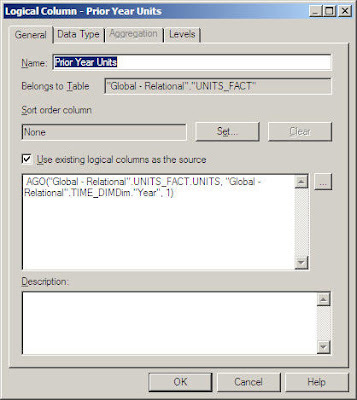 Generate Units and Generate Prior Year Units both from the base time and fact tables. 2. 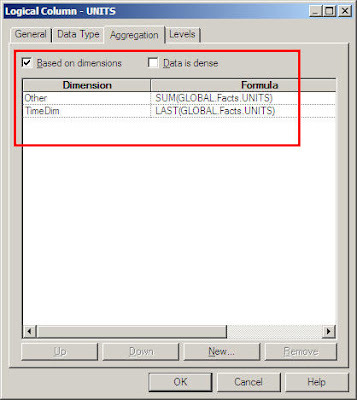 Generate Units from the base time and fact tables. 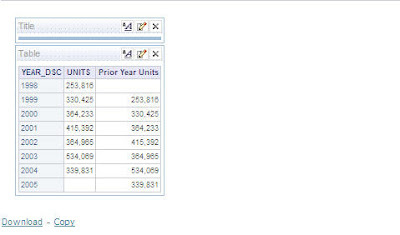 Then generate the Prior Year units based on Units data. Currently BI EE generates queries using the 1st approach mentioned above. But sometimes you realize that working on the resultant dataset is generally more efficient and predictable rather than going against the base tables again for the calculated dataset. If you look at the query generated to produce the above result, you would notice that the query generated is pretty complex and in fact sometimes can generate wrong results if you dont have the proper chronological key. Currently BI EE does not create the MODEL clause based sql queries out of the box. Neither it is possible to hardcode them directly into the BI Server. I am just hoping that this feature would be added in the coming releases. And, I have just scratched the surface of the capabilities this MODEL clause can offer. There are quite a few use cases wherein this can be extremely useful/effecient. I would cover them in the future blog entries. Now that 10.1.3.4.1 is out, i thought i would test out the security integration of BI EE and Essbase. If you have read my blog entries here and here, you would have noticed that there was a known bug around the 10.1.3.4 version of BI EE. Though there was a patch that was out earlier to resolve this, i never got around to install the patch. 10.1.3.4.1 is a patch release, so all the intermediary patches should have been bundled with this release as well. Once this filter is created, assign the filter to the admin1 user. So basically, admin1 has access to only one intersection. Every other intersection would produce #NoAccess in Excel addin. As a next step lets create a report out of the Global cube as the admin user. 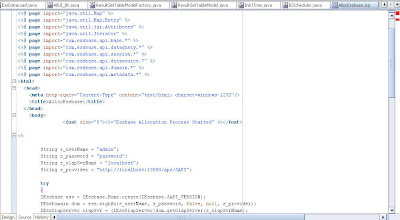 Now lets create a report in BI EE out of this global with admin user. Lets switch this user to admin1 in the connection pool and try viewing the same report. Thats so much better. So, by default BI EE does displays the #NoAccess intersections as null. The MDX generated still remains the same. 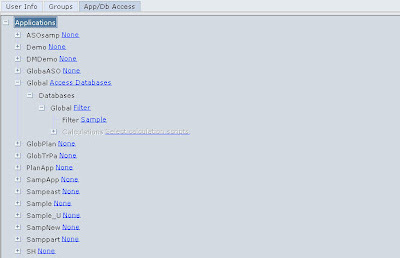 Lets change the filter a little bit as shown below to include more intersections for admin1’s access. It does look like this indeed works. Well this makes it more interesting. We now have a complete solution and sure opens up lot more opportunities for integration.